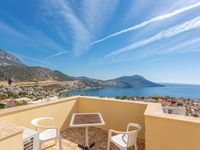 Property 6: Dream apartment in Kas with panorama view + complete equipment. Property 18: Luxury Penthouse with rooftop pool, stunning sea views, 5 min stroll to town. Property 26: Apartment with Fantastic Sea Views, Infinity Pool and Free WiFi. Property 27: Cactus 213 - top-floor apartment with beautiful views on 4 star resort. 4 pools. Property 28: Town Centre One Bedroom Apartment With Private Sun Terrace & 185m2 Shared Pool. Property 44: Brand New Luxury Modern Apartment With Stunning Sea Views and Private Roof Pool. Property 49: Wonderful Flat with Amazing View!